"RPi Engineering - Specialised Rover Engines"
Its what continental Europe has been a long time waiting for. At last over 80 years of accumulated Rover V8 engine experience available for you in central Europe. 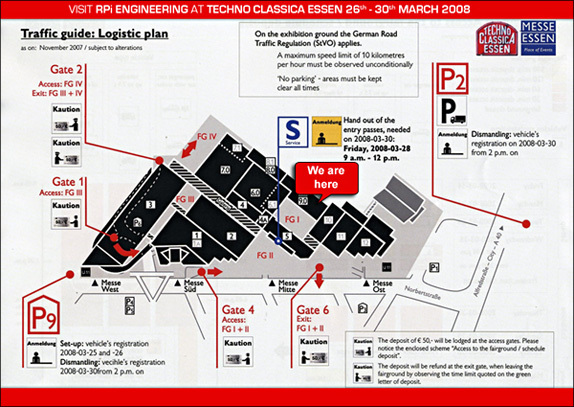 This year at the Techno Classica in Essen. March 26th till March 30th With the ultimate line up of specialists. What's more we are building our own stand, Traveling over in our own 101 forward control Land Rover and bring with us more V8 Rover accumulated experience than has ever been assemble at any one show ever. No introduction required and we bet you can't stop him talking Rover V8 & practicing his German on you. Frank has so many years of Morgan experience in Germany we daren't tell you how many, he is the Morgan Guru from Morgan Park in Hamburg and we are very pleased to have him available on our stand to address all Rover V8 engine issues regarding Morgan's, HMC, Land Rovers, Kit cars and all Classic Rover V8 vehicles. www.nowofoto.de Bottom of the list but possibly top importance Job. Our 'in house' camera man is unable to make it over with us, so we have entrusted this job upon Olaf. He will be sneaking around with video and camera equipment capturing those all important moments. And once the footage has been edited, it will be available for all to see on our rather special Rover V8 orientated YouTube site. (Marks web site) Mark is local to Essen living just outside Unna & has been paramount in setting up our IT server and with many many Morgan years under his belt he will be available to help fully translate the real benefits of our chipping and engine mapping processes as well as many there. A New and fantastic V8 opportunity.